I have been craving comfort food, and to me that means Thanksgiving food. So tonight I made some green bean casserole and mashed potatoes. Yum yum yum. If you haven't made the traditional green bean casserole before, you are seriously missing out. I've seen like a million people review Giada's Lemon Spaghetti and rate it very highly, but it never seemed substantial enough to constitute a meal. Then someone on the CLBB posted about things she added to it to make it a big substantial dish, and it sounded delicious so I went ahead and made it. My changes: I used shrimp instead of scallops and arugula instead of spinach (since spinach is still off-limits due to e.coli). I thought it was very good. It was so quick to put together yet still looked and tasted fancy. I wasn't blown away by the lemon spaghetti; I have no idea why it's so beloved because it isn't particularly special. But with the addition of shrimp, arugula, and tomatoes it was quite tasty. The lemon complimented the other flavors very well. I would make this again sometime for a quick weeknight dinner. Suggested Variation (CLBB - Robyn1007): Made the Lemon Spaghetti which was entirely too easy! Then I seared the scallops with a bit of salt and pepper in olive oil. Set aside to keep warm. In the same pan I sauteed minced garlic in olive oil and then added a touch of balsamic vinegar and chopped ripe tomato and sauteed until just warm. At the same time I wilted some spinach. To serve I placed the spinach in the pasta bowl, topped with spaghetti then scallops and the warmed tomatoes. Top with basil and parmesan and YUMMY! I really wanted to try this recipe from Mr. Emeril Lagasse, but didn't feel like putting forth so much effort (making mashed potatoes from scratch, rolling out pizza dough, etc) so I decided to simplify it. *Put all the toppings onto the Boboli and baked for 8 minutes at 450 degrees. My other changes: I added some green onions, omitted the Fontina, and used veggie bacon cooked in the same pan that I caramelized the onions in. It was very simple and turned out to be extremely delicious. I would like to try it with the homemade garlic mashed potatoes sometime, but for now Bob Evans is my friend. I will definitely make this again. When I do, I will probably use shredded Cheddar or a Cheddar-Jack combo in place of the provolone. It was good, but the bacon (veggie bacon, in my case) added enough of a smoky flavor, so the provolone was a little bit of overkill. Plus, I put cheddar cheese on my baked potatoes so it seems appropriate for this pizza. Garlic Mashed Potatoes: Combine potatoes, broth, and garlic in a large saucepan. Add additional water if necessary in order to keep all potatoes completely submerged. Bring to boil than reduce heat to low. Continue to cook until potatoes are tender, 25 to 30 minutes. Roll out the dough into a 1/4-inch thick circle. Place in a pizza pan or on a pizza peel. Spread on the garlic mashed potatoes. Evenly sprinkle the sauteed onions. Layer the sliced tomatoes. Evenly sprinkle the cheeses, bacon crumbles, cracked black pepper, and onion salt. Bake for 10 to 12 minutes. This is probably the most nutritious thing I have ever eaten in my life. If you are lacking in nutrients and trying to eat healthier, this is your meal. When I first saw the recipe in the pages of Cooking Light, I thought it sounded pretty gross. "What is this? Lima beans? Tofu? And quinoa?" I asked myself. "Gross." But it kept being highly reviewed and recommended to me, so I gave in. I am glad that I did, because it was really good. Granted, you do have to like the components to really enjoy it. Luckily, I do like them so I enjoyed my dinner. I will take this to lunch this week since it tastes best when chilled. My changes: I used a little bit of dried basil instead of the cup of fresh, and used some edamame (green soy beans) instead of lima beans. I loved the edamame in this dish. I highly recommend everyone make this change. Ever since I read first few books in Lemony Snickett's A Series of Unfortunate Events, I have wanted to make Pasta Puttanesca. I don't remember which book Violet makes it in because I read it quite awhile ago, but I think it's the first book. Whatever. Point is, it made me want to eat it, so today I made some. The recipe I used is from 101 Meatless Family Dishes by John Ettinger. I guess a traditional puttanesca sauce would involve anchovies, but this one does not use them. It was good, albeit time consuming (the sauce simmers for an hour and a half). I also am not sure yet if I like capers. I would make this again, but I'd like to find a recipe that is quicker to make so I can enjoy it during the week. I'd also like to find a healthier recipe, since the sodium content and calories for the recipe as it's written are astronomical (though I did cut down on the olive oil significantly, so that probably helped). Puree half the tomatoes and set aside. Heat oil in a skillet and add onion. Saute 3-4 minutes, then add garlic and saute 1 minute more. Add parsley, carrot, oregano, and basil and cook another minute or two. Add the remaining half of the tomatoes and tomato puree and bring to a boil. Cook down 5 minutes, stirring, then cover and simmer for an hour, stirring occasionally. Add the red wine, capers, and olives, and simmer, uncovered, 20 minutes longer. Meanwhile, cook pasta according to package directions and drain. Toss sauce with pasta and top with Parmesan cheese, if desired. I put this recipe on my week's meal plan, bought the ingredients, and printed out the recipe only to discover that - gasp! - it was a Rachael Ray recipe that somehow managed to remain in my recipe program after I deleted a ton of her stuff a couple weeks ago. But since I already had all the stuff for it, I went ahead and made it. It was actually very, very good. I didn't make the marinara sauce (I skipped step 2 entirely and just used a jar of tomato-basil marinara from Trader Joe's), so I'm guessing that part is the part of the recipe that would have sucked. But the ravioli itself turned out really nicely. I was surprised. I would make this again. My changes: store-bought marinara, Pecorino Romano instead of parmesan, and lite 4-cheese ravioli instead of spinach & cheese ravioli. Beat eggs and a splash of milk seasoned with salt and pepper in a shallow dish. Combine bread crumbs with cheese and parsley in a second dish. Coat the fresh pasta in egg then bread crumbs. Heat 3 tablespoons extra-virgin olive oil over medium heat in a skillet then toast the ravioli until deep golden, 3 to 4 minutes on each side. In a small sauce pot heat the remaining extra-virgin olive oil and the garlic and red pepper flakes over medium low heat. Grind the roasted peppers in the food processor and add to garlic after it sautes for a couple of minutes. Stir in tomatoes and season the sauce with salt and pepper. When ready to serve, transfer sauce to a small bowl. Surround the sauce with toasted ravioli for dipping and serve. Another non-recipe recipe, for a tasty and quick sandwich. It was pretty good. I would make it again, though I'm not so sure about the provolone because it kind of overpowered the other flavors. Maybe I would omit the cheese next time. I think I found this recipe on the CLBB, but it was originally posted on everybodylikessandwiches.blogspot.com. The pasta dish I made for dinner tonight comes from Everyday Food's June 2005 issue. I was drawn to it because it was in a section called "Cooking for One." I'm having issues trying to learn to cook for only myself, without hundreds of days worth of leftovers, so this seemed good. Plus it is quick and simple for a weeknight dinner. It was very good! I liked how quickly it came together, and it was tasty. Not the most complex dish, but still very yummy. I would make this again, and could easily vary the types of mushrooms and cheeses to whatever I have on hand. I also think it might be nice with a little mascarpone or cream cheese melted in to make it creamy. Yum yum. My changes: I used baby portobello mushrooms instead of shiitake, and I added about 1/4 cup of frozen peas as well. I also used shaved Pecorino Romano cheese instead of grated Parmesan. 1. In a large pot of boiling salted water, cook tortellini according to package instructions; drain. 2. Meanwhile, in a large skillet, heat oil over medium-low heat. Add mushrooms and garlic; cook, stirring frequently, until mushrooms are tender, about 7 minutes. 3. Add 1 cup water; season with salt and pepper. Cook until liquid is reduced by half, about 5 minutes. Remove from heat; add tortellini, Parmesan, butter, and parsley. Toss to coat; serve. Note: If you find fresh tortellini, you can use that instead of frozen; cook in a pot of boiling salted water until the pasta floats to the top, about 3 minutes. I was inspired by a recipe from Everyday Food magazine to create a platter of vegetarian Middle Eastern foods. I had planned to just follow the recipe, which involved making a dish similar to tabbouleh from scratch, but I was lazy and instead decided to just buy some tabbouleh. So my plate consisted of: tabbouleh, roasted garlic hummus sprinkled with paprika, kalamata olives, a nice big piece of feta cheese, and warm pita bread. It was exactly what I needed - virtually no prep work, yet a delicious meal is produced. I will definitely do this again. I made this cream cheese spread from Alton Brown ("Good Eats") to put on bagels for my lunches this week. It is excellent and delicious. I am a big fan of vegetable cream cheese, and this is a really good one. The recipe made enough to get me through the week, which will be perfect. I would definitely make this again. Place the bell pepper, onion, garlic, zucchini, and olive oil in a medium mixing bowl and toss until the vegetables are coated. Spread the vegetables evenly on sheet pan lined with foil and place to the oven. Roast, tossing occasionally, until they are soft and are beginning to turn brown around the edges, approximately 45 minutes. Remove from the oven and cool completely. Another losing recipe from Miss Rachael Ray! The woman is just not a good chef. I've only had maybe one or two good recipes from her, and any other ones I try have been just terrible. This recipe sounded delicious, but it was not. I did substitute a couple of things (veggie sausage for real sausage; red wine for white) but those were not what was causing the recipe to be un-tasty. I don't know what it was, it just wasn't good. The whole thing went into the trashcan. It is too bad because I really love fennel. Place a large pot of water on to boil for pasta. Salt water and add bucatini and cook to al dente. While water comes to boil and pasta cooks, make the sauce. Heat a large, deep nonstick skillet over medium high heat. Add 1 tablespoon extra-virgin olive oil, 1 turn of the pan. Add sausage to the skillet and break up the sausage into small bits. Brown sausage all over then transfer to a paper towel lined plate. Return pan to heat and add 2 tablespoons extra-virgin olive oil, 2 turns of the pan, the garlic, fennel, onions and peppers. Season the vegetables with salt and pepper. Cook, turning frequently, 7 to 8 minutes until tender but do not allow the fennel and onions to brown - reduce heat a bit if they begin to. Add the wine or stock next and reduce 2 minutes. Stir in the tomatoes and the sausage. Reduce heat to a simmer and cook until pasta is done. Drain the pasta very well and add to the sauce. Sprinkle the pasta with 1/2 cup cheese, a couple of handfuls, then toss pasta with thick sauce to combine. Transfer pasta to a large shallow platter and cover with the pasta with basil leaves. Serve with extra cheese and pass crusty bread at the table to mop up the plates. Aloo gobi is generally a delectably spicy Indian dish with potatoes and cauliflower in a flavorful curry sauce. I order it at Indian restaurants all the time. However, replicating it at home has proven to be difficult. I keep trying new recipes, and they all seem to come up short. Tonight's recipe, yoinked from the CLBB (and apparently originally found on the Bend it Like Beckham DVD extras), was probably the most disappointing one I have tried in my entire life. It had so many spices in it - garam masala and turmeric and cumin and ginger, etc. - but still managed to be one of the most flavorless Indian dishes I've ever had. I did not alter the recipe much, except to reduce the amount of oil (to just a couple of tablespoons), add peas (I like my aloo gobi to have peas in it), and increase the cooking time (to about 30 minutes, because the potatoes took a long time to cook). I served it with some excellent store-bought tandoori naan, which I heated and sprinkled with melted butter, garlic, and cilantro. That naan was the best part of the meal by far. I would not make this particular aloo gobi recipe again. Heat vegetable oil in a large saucepan. Add the chopped onion and one tablespoon of cumin seeds to the oil. Stir together and cook until onions become creamy, golden, and translucent. Add chopped coriander stalks, two teaspoons of turmeric, and one teaspoon of salt. Add chopped chillis (according to taste). Stir tomatoes into onion mixture. Add ginger and garlic; mix thoroughly. Add potatoes and cauliflower to the sauce plus a few tablespoons of water (ensuring that the mixture doesn't stick to the saucepan). Ensure that the potatoes and cauliflower are coated with the curry sauce. Cover and allow to simmer for twenty minutes (or until potatoes are cooked). Add two teaspoons of Garam Masala and stir. Sprinkle chopped coriander leaves on top of the curry. Turn off the heat, cover, and leave for as long as possible before serving. This recipe is from Gourmet magazine's July 2006 issue. It looked tasty to me. I made it for dinner tonight and it was pretty good but nothing special. It also wasn't too spicy so I would add more Sriracha next time. The coconut rice was excellent (I made it with instant rice so it cooked quicker than in the recipe) and I would make it again. 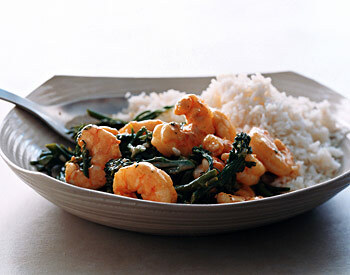 But the shrimp part was just OK.
My changes: instant rice; broccoli and baby corn instead of broccolini; vegetable bouillon instead of chicken broth; and tiny frozen shrimp instead of large fresh shrimp (hey, it was $2.99 for a lb of them). Rinse rice in a sieve under cold water, then shake well to drain and transfer to a 1 1/2-to 2-quart heavy saucepan. Add water (1 1/2 cups), sugar, 1 cup coconut milk, and 3/4 teaspoon salt. Bring to a boil, partially covered, then reduce heat to low and cover completely. Cook 20 minutes, then remove from heat and let stand, covered, 5 minutes. While rice cooks, trim Broccolini, discarding 1/4 inch from bottom, then cut diagonally into 1-inch lengths. Toss shrimp with Sriracha sauce and remaining 3/4 teaspoon salt in a bowl. Stir together cornstarch, 1/4 cup chicken broth, and remaining 1/2 cup coconut milk in another bowl until cornstarch is completely dissolved. Heat a 12- to 14-inch well-seasoned flat-bottomed wok or a 12-inch heavy skillet over high heat until it just begins to smoke, then add oil, swirling to coat. Add Broccolini and stir-fry until bright green, then add remaining 1/4 cup chicken broth and stir-fry until liquid is evaporated, about 3 minutes. Add shrimp mixture and cook, stirring frequently, 2 minutes. Stir cornstarch mixture, then pour it down side of wok and boil, stirring, until sauce is slightly thickened and shrimp are just cooked through, about 3 minutes more. Fluff rice with a fork and serve with shrimp immediately. This recipe, from Eating Well, was very quick and simple, and very good. I didn't have any more tomatoes, but it was good even without the tomatoes. Oh and obviously I don't own a grill so I made it in the oven. I would make this again. Also, the barbecue sauce I bought for this meal was Sweet Baby Ray's, which was recommended on SA. It is the best barbecue sauce ever. It reminds me of the sauce at McDonalds that I love, except better. This recipe from an old issue of Martha Stewart Living has always looked delicious to me, but the long ingredients list has always intimidated me. I decided to make it for dinner tonight because a)why not, and b)I can take it in my lunches to work this week. Plus it gives me an excuse to use my saffron from India that I was given for free. My changes to it were numerous: I used microwave basmati rice (Patak's is excellent) instead of cooking it myself; ground cumin instead of whole cumin seeds; omitted the cloves; and used frozen cauliflower and green beans. My thoughts: It was excellent. It tasted exactly like the biryani I order at Indian restaurants. Make sure you remove the cinnamon sticks before putting it in the baking dish, but don't omit them because cinnamon is an important flavor. Next time I will probably use fresh green beans because the frozen ones just didn't do it for me. I will forever use this microwave basmati rice because it is amazing. In general, an excellent recipe that I will make again. 1. Preheat oven to 350°. Combine saffron and milk in a small bowl; set aside. Place rice in a medium saucepan with 1 1/2 cups cold water. Bring to a boil over high heat, stir once, then reduce heat to low. Cover and simmer until rice has absorbed all the water, about 20 minutes. 2. Meanwhile, heat 2 tbsp oil in a large saute pan over medium-high heat. Add onions; cook, stirring, until golden brown and slightly crisp, about 10 minutes. Remove half the onions from pan, and reserve. Add remaining tablespoon oil along with the spices, ginger, garlic, and tomatoes. Cook, stirring, until fragrant, about 2 minutes. 3. Pour 1 cup water into pan; bring to a simmer over medium-low heat. Add green beans, cauliflower, carrots, chickpeas, and salt; reduce heat to a simmer and cover pan. Cook until vegetables are crisp-tender, about 10 minutes. Add peas, and cook until bright green, about 2 minutes. Remove pan from heat. 4. Place one-third of the rice in a 3 1/2 quart heavy-bottom casserole or baking dish with a tight-fitting lid. Drizzle half the saffron milk over rice. Using a slotted spoon, transfer half the vegetable mixture to the casserole, leaving liquid behind. Place one-third of rice on top; drizzle with remaining saffron milk. Repeat with remaining vegetables and rice. Spread reserved onions over the top; sprinkle with cashews. I wanted to make some cookies to take to work so I can slyly win everyone over, so I decided on this recipe from Sara Foster's Fresh Every Day cookbook (posted on the CLBB). It's always been highly reviewed, and I had all of the ingredients on hand already, so I chose this one. I was a little bit disappointed. They're good and have an excellent texture - nice and thick. However, they just aren't good enough to take to work. I had hoped they would be a little more impressive. As is, I am enjoying eating them and will happily take them in my lunches this week. :) I probably won't make this recipe again because there are better peanut butter chocolate chip cookie recipes out there, but it was good. 1. Preheat oven to 350. Line two baking sheets with parchment paper or grease lightly. 2. Cream the butter, peanut butter, and brown sugar together in a large bowl with an electric mixer on high speed until fluffy. Add the egg and vanilla and mix until the ingredients are combined. 3. In a separate large bowl, stir the flour, baking soda, and salt together. Stir the flour mixture into the peanut butter mixture until the flour is no longer visible. Stir in the chocolate chip until evenly distributed. 4. Scoop the dough with a 1/4-cup measure or ice cream scoop and drop it onto the prepared cookie sheet, leaving 3 in. between the cookies. Use the tines of a fork to flatten the tops of the cookies to 1/2-1/4-inch thickness with a crosshatch pattern. 5. Bake the cookies on a center rack for 15-17 minutes, rotating the pans halfway for even baking, until the cookies are golden brown. Let the cookies cool on the baking sheet for 5-10 minutes before transferring them to a wire rack to cool completely. My ma used to make these when I was younger, but then I stopped eating meat and the world was sad. But then I discovered vegetarian sausage, which tastes remarkably like real sausage since the sage and other herbs are what make it taste good in the first place. This isn't a "real" recipe because you can vary it however you want, but I will approximate what I used. Keep in mind that I am only one person but I was hungry today so I made two burritos. Usually one burrito + a breakfasty side dish (hashbrowns or something) is more than enough food. So I guess this recipe is for two people. Scramble the eggs in a frying pan. At the last minute, throw in the chiles and cook a little bit more. Add the sausage. Divide mixture between the two tortillas and top with sour cream and cheese. Roll up and consume. I found this recipe for Spinach Dip somewhere- maybe on the CLBB? Not sure. But it appealed to me because it's a variation of the ever-present Knorr's Spinach Dip that I love so much. It was very good, and I enjoyed it with some Harvest Grain crackers. I probably will not make this version again, as I continue my quest for the definitive spinach dip. But I would recommend it to others. It was yummy. Drain spinach and squeeze dry. In a bowl, combine dip ingredients; season with salt and pepper; Chill 8 hours or overnight. Adjust seasoning before serving.